The Chartered Institute of Management Accountants is a UK based professional body offering training and qualification in management accountancy and related subjects, focused on accounting for business. It is the largest management accounting body in the world, with more than 200,000 members and students in 173 countries. The Institute is also a member of the International Federation of Accountants. In India, it is one of the most well recognized foreign Institutes imparting professional education in Financial & Cost Accounting. The Institute of Cost Accountants of India has signed a Memorandum of Understanding with CIMA whereby qualified professionals of either of the two institutes can also obtain membership of the other through a fast-track route, which gives exemption from a number of papers to qualified professionals of the other Institute. The course is divided into three main levels viz. Operational, Management and Strategic, each of which have three papers. An entry level examination of five papers called “Certificate in Business Accounting” has to be passed before registering as a student of the Institute. However, graduates in accounting or business can directly seek student membership. 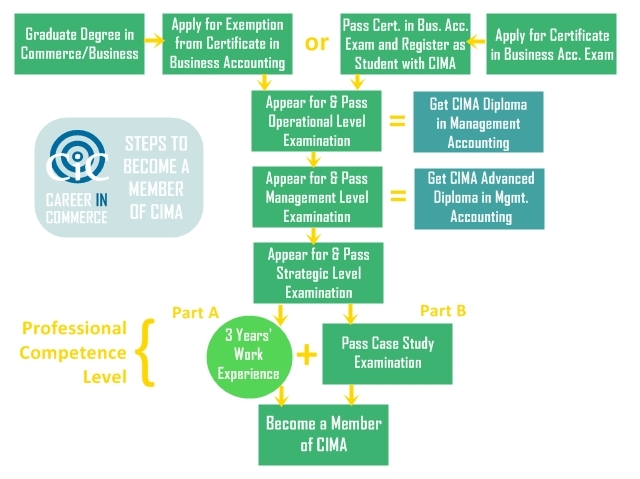 The CIMA provides membership only to a student who, apart from passing the nine papers across three levels, has work experience of at least three years in the field of accounting and has passed a case study exam conducted by CIMA. The Institute conducts exams four times in a year, in March, May, September and November. There are various exam centres in India, across ten different cities. The job prospects on becoming a member of CIMA are immense, not only in India, but globally. To view the consolidated detailed syllabus, click here.